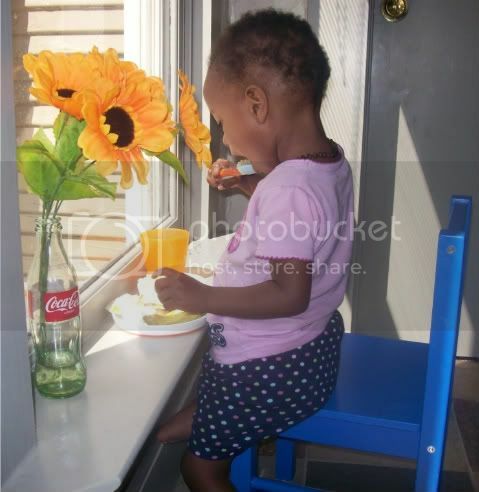 Over the weekend Damon pulled one of Marlie's table chairs up to the window sill and set her lunch on it. He named it Cafe Marlie. She has a beautiful flower arrangement, a view of the backyard and lots of natural light. Guess where she wanted lunch on Monday? It looks like Cafe Marlie is officially open for business and she has the best seat in the house. Awwww! She has the best seat in the house! awwww that is so cute. love it! That is too cute! Getting her Vitamin D, and enjoying a nice view while she dines! What a wonderful idea! I love it. So Sweet! A fine dining experience. Love the title of your blog. This is too adorable Teresha and such a great idea. I'd love such a window view also! CLOSED...Easy Organic Living Challenge Giveaway! Easy Organic Living Challenge #2: Invent a Snack! I'm an Easy Organic Living Challenge Blogger! Spring Forward With Pier 1 Imports!